Yes, I can’t believe “Raccoon” wasn’t taken either. 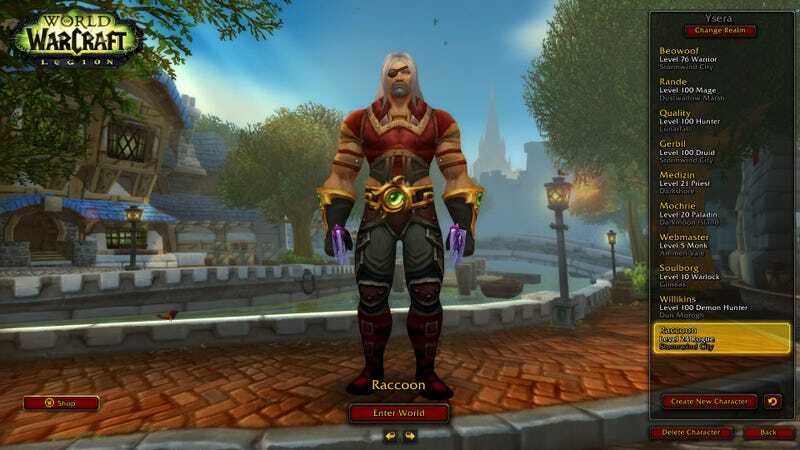 This is Raccoon, my new World of Warcraft rogue, looking dapper at level 24. This screenshot was taken on Friday afternoon, the day after he was created. As of this morning he’s level 91. He’ll hit the level 100 cap this evening. He’s been working out, with demons. Now any power-leveler can get a character from 1 to 100 in World of Warcraft in a matter of days, but I’m no power-leveler. Over the weekend I spent time with my kids, took them to visit their grandparents, went to the store, watched some television, did a little light cleaning and got plenty of sleep. In between all of that I spent every playing moment hopping from demon invasion to demon invasion in World of Warcraft (note you must be at least level 10 to participate). Don’t worry, I’ll switch him back to his cool grizzled old rogue look once I hit cap. I showed off the demon invasions last week in video form. Leading up to the August 30 release of World of Warcraft’s Legion expansion, six select areas in the old world regularly play host to massive, level-scaling events in which an army from the nether attempts to establish a foothold in Azeroth. Players from both factions, Horde and Alliance, converge on these areas to drive the demons back, reaping tremendous experience point rewards (as well as equipment) in the process. The skies over Tanaris, swarming with players. To get the levels, a player does have to put in a bit of work. Logging into an event zone and sitting idle will score experience points, but only the bare minimum. The key is to fight. Tag every demon you can with at least a little damage. I’ve come in on the tail-end of a battle with a massive boss, hit it with one shot from my Outlaw Rogue’s (so much fun!) gun, and gotten 40K experience for my trouble. Note the experience bar. This shot taken at 8:30 this morning during an invasion with very low attendence. Play during peak times, so there are plenty of people participating in each battle. More people equals more bosses being felled, which means more experience for everybody. Follow the crowd. At this point players have worked out the most proficient way to work through spawns during the events. I’d been fumbling about the Northern Barrens invasion for a couple days, wondering where everyone was. Last night I found everyone, sweeping across the plains en masse, performing surgical strikes on name elite creatures from the Crossroads all the way down to the Goblin port of Ratchet. Here’s a shot from 8:54 this morning. It was pretty much just me and a couple other players and I had to log out for work before wave three was over, but you get the idea. Normally I prepare for a new World of Warcraft expansion by getting one of my characters to the level cap. At this rate, I’ll have at least six characters to choose from on the Ysera server alone. I feel kind of stupid for using that level 100 boost on my Druid. Check out the guide over at WowHead for a comprehensive look at the Legion pre-expansion event, like the fun bit where you hearth back to Stormwind and die instantly from a demon area-of-effect attack.